We did a little homeschool yesterday morning. Then we left the house and did a whole lot more learning. Sometimes I need reminding that most of our education comes when we leave the house, and I need to put down the classroom to-do list and relax a little. Relaxing… not my strong point. 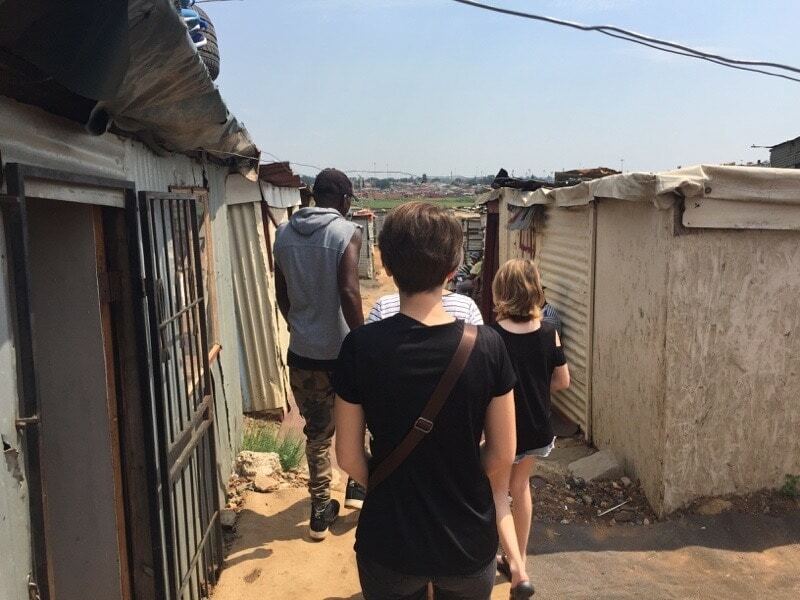 We arranged for a tour of Soweto yesterday. 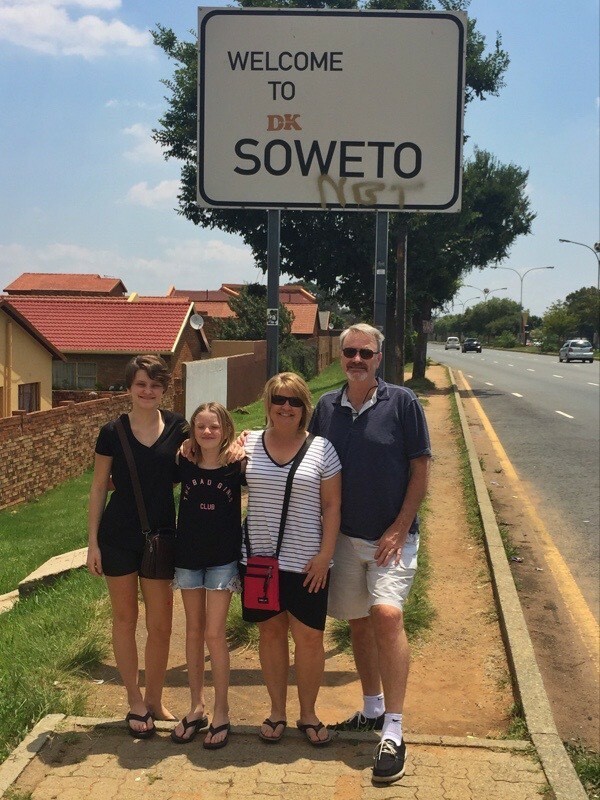 Soweto means SOuth WEstern TOwnship and is a massive suburb of Johannesburg, including Nelson Mandela’s house and most of the area where Apartheid opponents demonstrated and fought for equality. 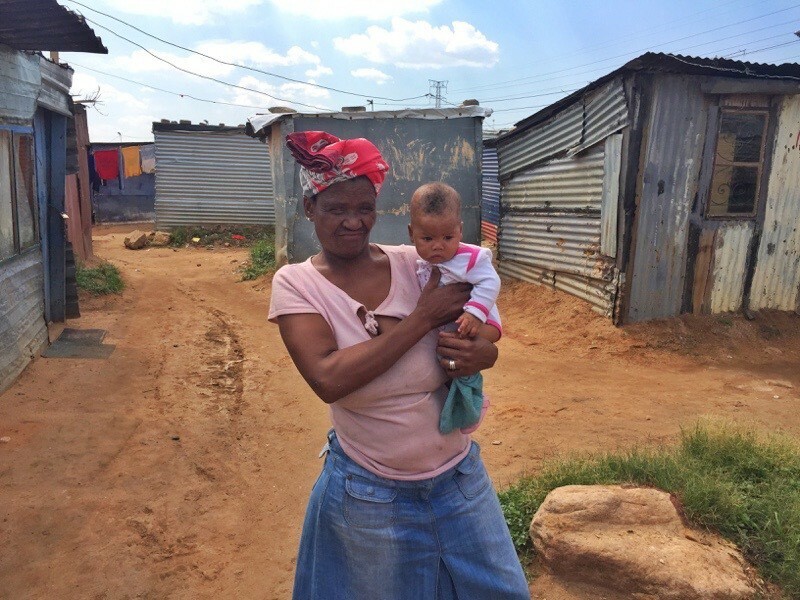 The 2011 census estimates that 40% of Johannesburg’s 4.4 million residents live in Soweto. The area is made up of 98% black residents. 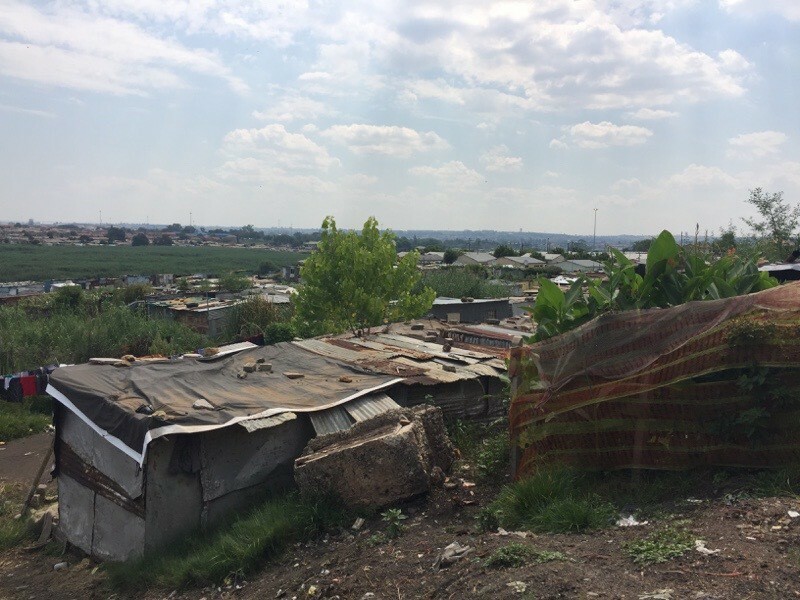 A little blurb from the history books tells us: Soweto is an urban settlement or ‘township’ in South Africa, southwest of Johannesburg; with a population of approximately 1.3 million (2008, Joburg archive). 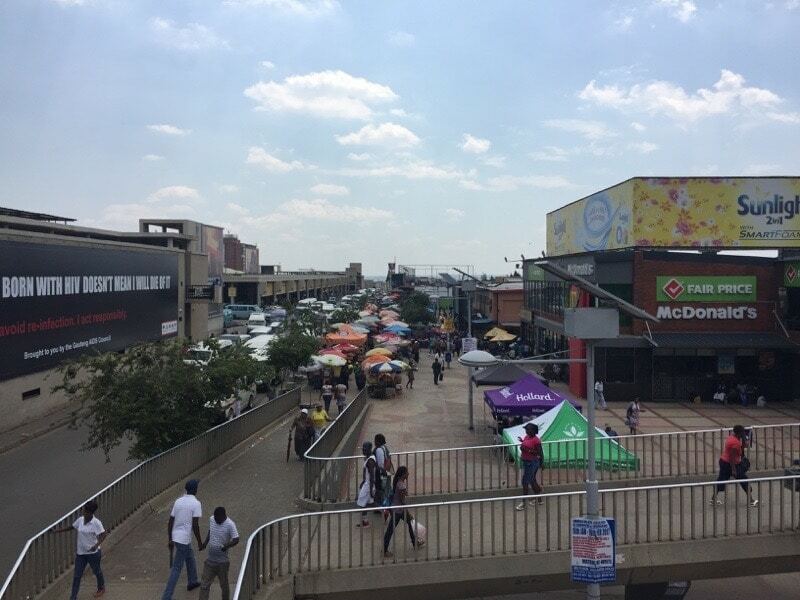 Soweto was created in the 1930s when the White government started separating Blacks from Whites. Blacks were moved away from Johannesburg, to an area separated from White suburbs by a so-called cordon sanitaire (or sanitary corridor) this was usually a river, a railway track, an industrial area or a highway etc., they did this by using the infamous ‘Urban Areas Act’ in 1923. 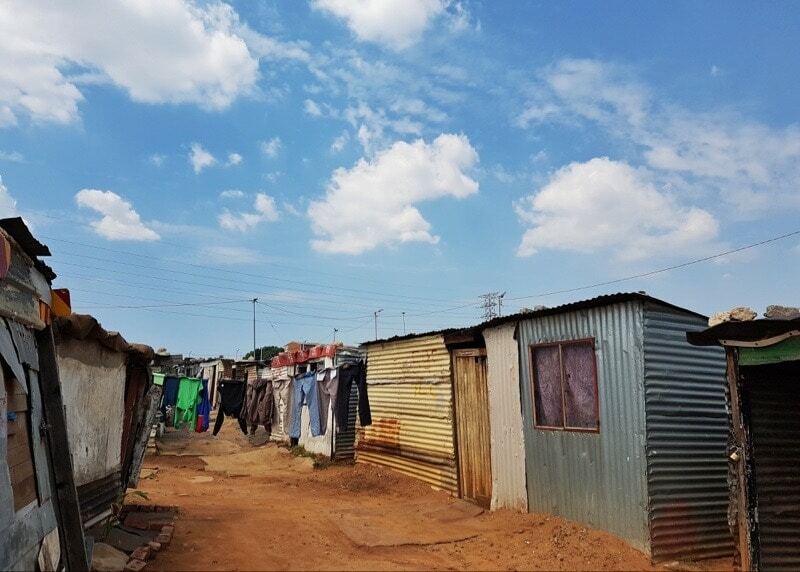 Soweto became the largest Black city in South Africa, but until 1976 its population could have status only as temporary residents, serving as a workforce for Johannesburg. It experienced civil unrest during the apartheid regime. There were serious riots in 1976, sparked by a ruling that Afrikaans (language of the white settlers) be used in African schools here; the riots were violently suppressed, with 176 striking students killed and more than 1,000 injured. Reforms followed, but riots flared up again in 1985 and continued until the first multiracial elections were held in April 1994. 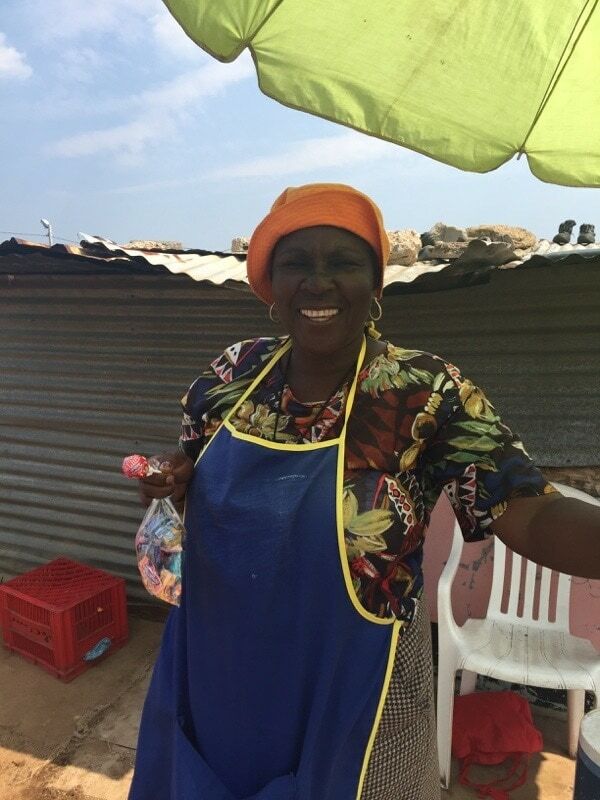 There are multiple tours you can find that will take you to Soweto. There are giant buses that will drive around, or small vans that connect to the hop on/hop off bus and we even found a photo journalist that will take you around where people will hand you their babies and invite you into their house for a meal. We opted for something in between those last two options and had a black South African man take us around in his car. His name was Peter and he was very knowledgeable about the area. We stopped first at Nelson Mandela’s last house in Johannesburg, where he died, and discussed a little more of the history of his life and his impact on this nation. That was a very nice house in a nice part of town and it still is. One of his grandchildren still lives there. Stay tuned for a full blog post about Apartheid, Mandela and all we’ve learned about this incredibly complex history of South Africa. We haven’t finished that unit yet in homeschool. 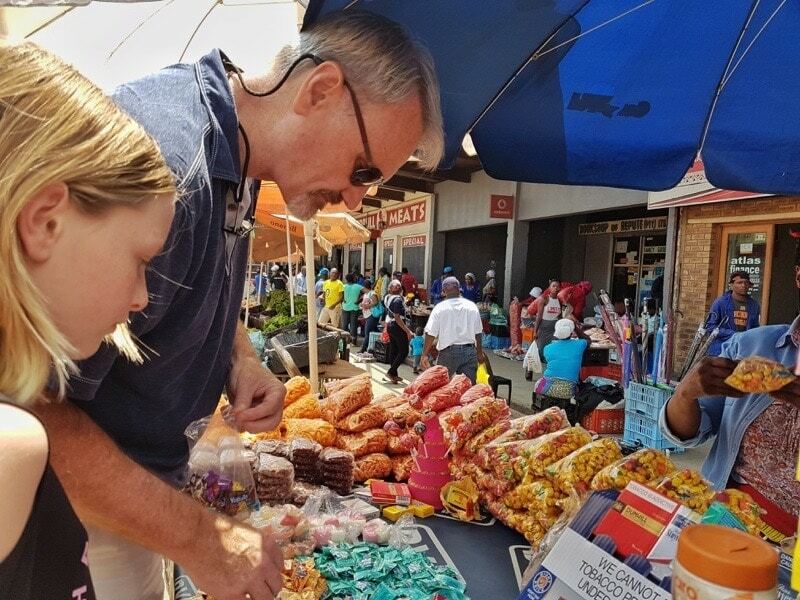 From Mandela’s last house we headed to Soweto and Peter took us to a market. We were the only white people and he encouraged us to get out and walk around and talk to people and he would pick us up down the block at the other end of the market. That took a little getting used to. The market was crowded with people who all seemed to know what they were doing and all had somewhere to be. Here we are a stark white family stumbling out of a van and looking a little shell-shocked. But our guide suggested we buy some candies for the kids we would see later in the tour so we had a mission. Haley and I also have small tins (the size of an Altoids tin) that we buy for each country and we look for “tin things” to put in as a reminder of our time in that country. So this market was a great place for tin things too. We started walking and when we saw things we didn’t know or understand we’d stop to ask a few questions. Once we started talking to people the awkwardness fell away and it was very enjoyable. Not all the sellers understood English, or at least our American accented-English. But we made it work. We bought a few things like ears of corn and a few things for our tins and some candies for the kids we were to see later. Our tour guide did not accompany us on this part. He said that if he came with us, the people would not talk to us. I think he was encouraging us to spread our wings a bit and it worked. I think he also felt that if he walked around with us, it would convey that we felt we needed a bodyguard and that we didn’t trust the people. We certainly didn’t want to imply that so we were content to comply with his recommendations. Top view of the market. Dan is picking out candies. I’m not fond of taking impoverished kids a bunch of sugar but it’s what our guide recommended so we followed his advice. 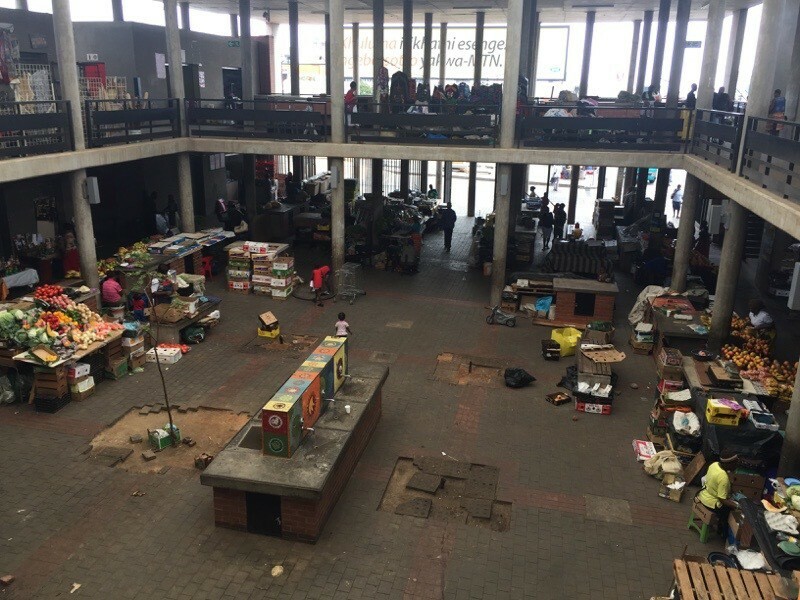 This is the indoor area of the market. This lady had one of the few actual stores at the market. We bought a few items. She was lovely. There was one area where I desperately wanted a picture but I couldn’t take it without feeling like I was putting people on display, as if they were in a zoo. In one of the outdoor areas of the market there were 4 metal tables set up. There was a bowl of rice on each table and a pile of meat (directly on the table) that someone was cutting up in to pieces. Workers were standing around eating, using only their hands. They would scoop up the rice in their hand, add in some of the meat from the publicly available piles of meat. Our guide said it was cow brains and suggested Dan try it. Dan was eyeing the KFC across the street and politely declined. There was no silverware, no plates, and everyone was sharing the same bowls of food. It was awesome, and so different. I admit it smelled good but that’s the closest I could get to participating. 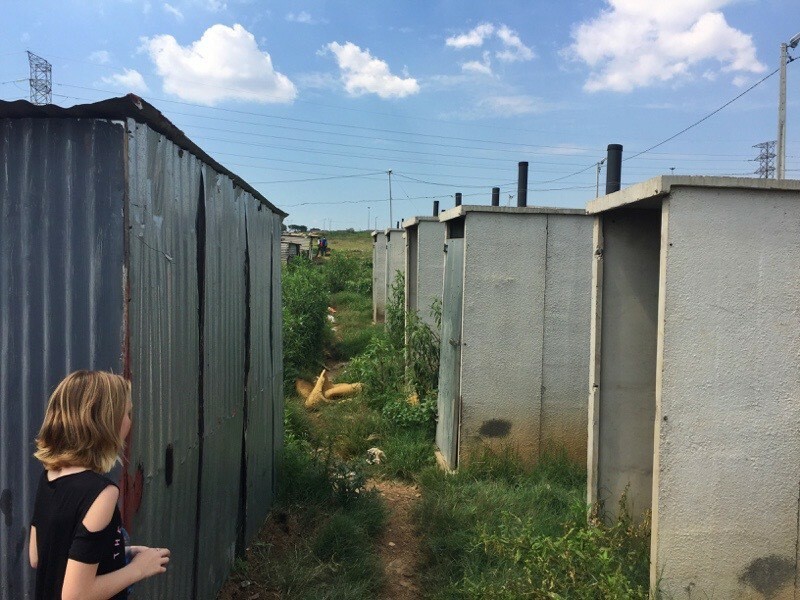 After the market we stopped in a very poor area where residents have set up shacks as housing. 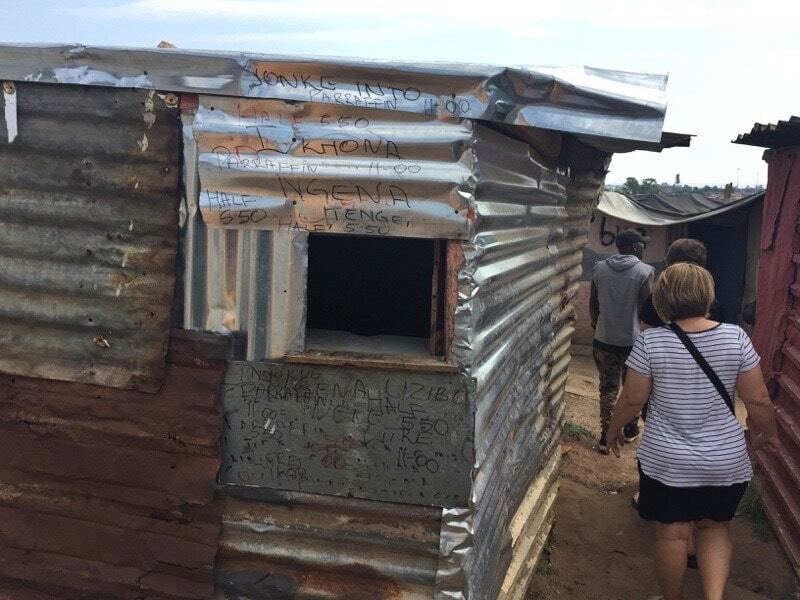 Our tour guide said that we would be handed over to another guide who would take us through the shanty town. Peter said that if he came with us, again, it would imply that we do not trust the guide from the squatter’s camp. So we met Bongani who appeared to be just out of high school and he took us around the area. These houses are pretty much what you’ve seen on TV or perhaps in person if you’ve done mission work or seen areas of extreme poverty. They were haphazardly constructed of corrugated metal and usually no bigger than a small bedroom that we might be used to. They have no running water, no electricity and usually only a makeshift food prep area and a bed. Concrete outhouses are set up along the perimeter of the area, although for some residents it means a 5-10 minute walk to get there. They do not have running water (or doors) but the city comes by once a month to clean out the outhouse holes. It’s pretty much a concrete port-a-potty, but over a hole in the ground. 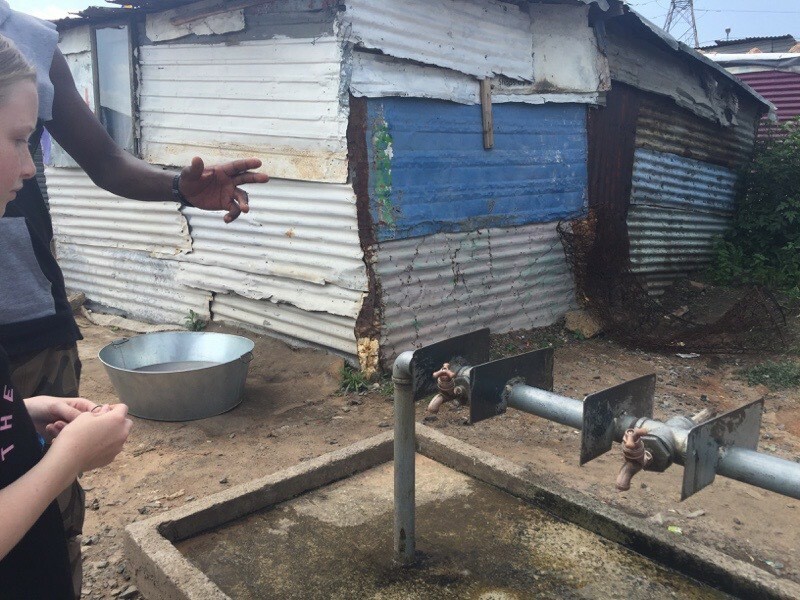 In another area there are some spigots of running water in community areas where residents come with their buckets to get water for cooking or drinking or laundry. It’s clean and can be used for any purpose. The distance between the bathrooms and the running water made it clear that there was probably no hand washing after using the facilities. The camp goes on and on and on, in no real order without any logical pathways. People have just set up small structures wherever they can. 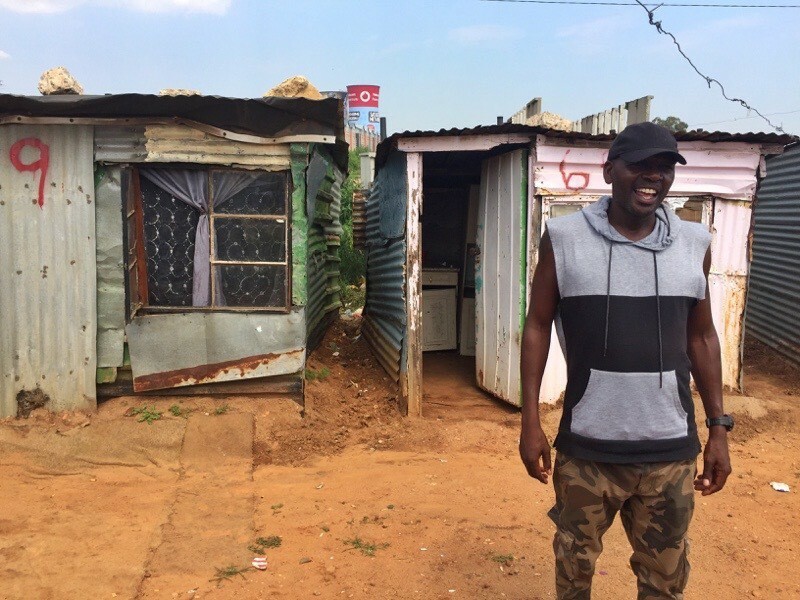 The structures can cost around 3000 Rand ($223 USD) to build and can take months because many people cannot afford to buy the materials so they forage and construct whatever dwelling they can manage over time. There are wires strung up between all the houses for laundry drying. Our tour guide whom we thought was a teen. You can see the homes and the cooling towers in the background. More on that in a minute. Not all the homes had space in between them. A lot of them had shared walls. The running water for this area of the camp. It was probably 100 feet from the bathrooms. The camp continues down the hill and beyond. As we walked through the camp our guide told us about the people who live there. He encouraged us to take pictures and then tip people whose pictures we took. The kids that lived in the shanty town were just getting off school while we were there and they looked so cute coming home in their little uniforms. Our guide said that kindergartens are very close by, but once kids go to first grade they might have to walk 20-30 minutes to get to school each day. They are encouraging the kids to participate in sports, and branch out from just soccer. They work hard on HIV/AIDS education and are attempting to decrease teen pregnancy, which is a real problem. The day we toured was clear and relatively warm, but it was obvious that when it rained heavily (which it does here) the camp would be extremely challenging. Leaking houses, flooding along the dirt paths and water draining from higher elevations all would create havoc in this camp. But there’s nothing they can do about it so they simply accept it as part of life. The houses themselves were very small and dark. They typically have one propane burner for cooking and one kerosene lamp for light. The house we viewed had a small refrigerator but it was not working because there was no electricity. It’s just used for storage. Houses that have a few more resources use car batteries to power the rare television or working refrigerator. There are a few pop-up convenience stores in the area. They are called “spaza” which means “not real”. They are not real stores, but they are available if you need something small like a carton of milk or a small packet of sugar. We could not distinguish the spazas from the houses other than that they had writing on the walls of a few items for sale along with prices. The spaza – the store. This woman has 5 children. Dan asked her to smile and this is what we got. We tipped her well and she seemed to appreciate it. She then invited us into her home. They really try to make the best of them even when they are small. She had some kind of covering over the dirt floor. She does not wear shoes. There was one other room where the other 4 kids were napping. It was hot in her house. 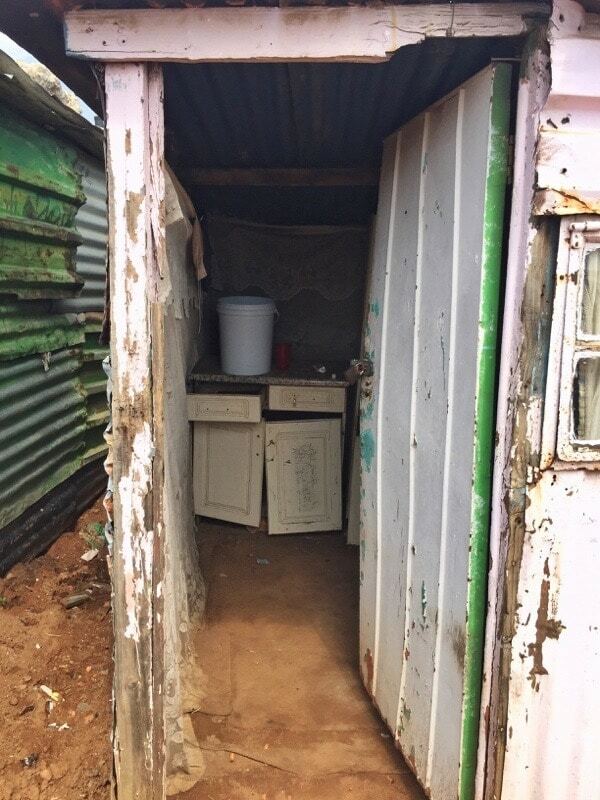 Inside a different shack. Missing a motherly touch I think. After the camp tour this lady wanted to sell us some handicrafts. 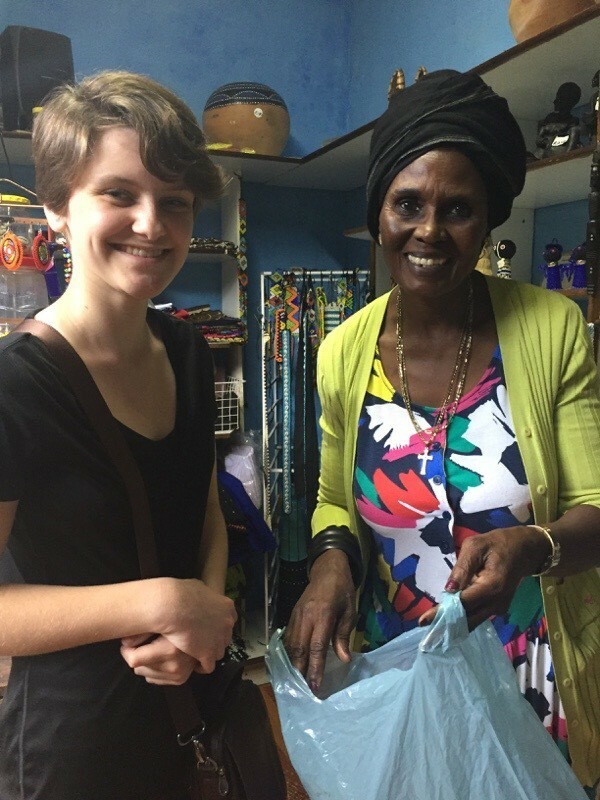 We didn’t buy any because we only carry one suitcase but we gave her a donation for her art. She was so sweet. The candies she’s holding was the candy we bought. We asked her to hand it out to the kids as they came home from school. Of course this tour made an impact on us. We explained to the girls that the cost of the house in that area was about what we are paying for our backup internet mobile 4G router and service for one month. They were quiet, paying very close attention, smiling at people as we passed them and I’m sure taking careful note of the difference in how people are forced to live in this world. It’s one of those experiences that will take awhile to really sink in, but you find yourself rolling it around in your mind as you proceed throughout your day and week. After the tour we went to a mall to buy shoes for Haley. I felt guilty for buying things like new shoes but at the same time you know that NOT buying those shoes won’t help either. The best we can do is to encourage other people to go and see how they live, tip well for pictures taken and spread the word that places like this do exist and support the local economy as much as you can. Our tour guide turned out to be 42 and had 4 children. We were astounded. One thing we did NOT see nor hear about was drugs. Drugs didn’t seem to be a problem there. When you can barely afford to eat, I guess you aren’t buying drugs. We also saw no phones. Perhaps that also was an issue with charging and paying for service…all luxuries in this area. 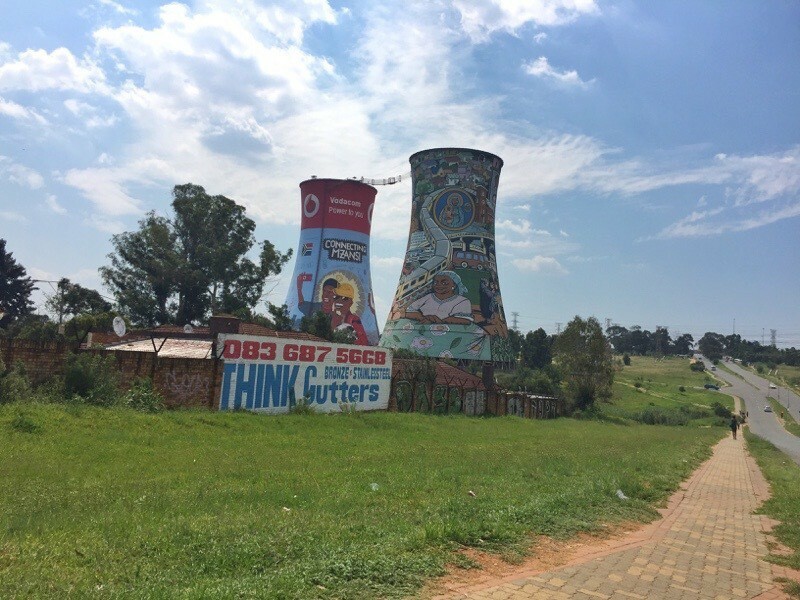 An iconic symbol of Soweto are the two cooling towers from the now-closed coal plant. 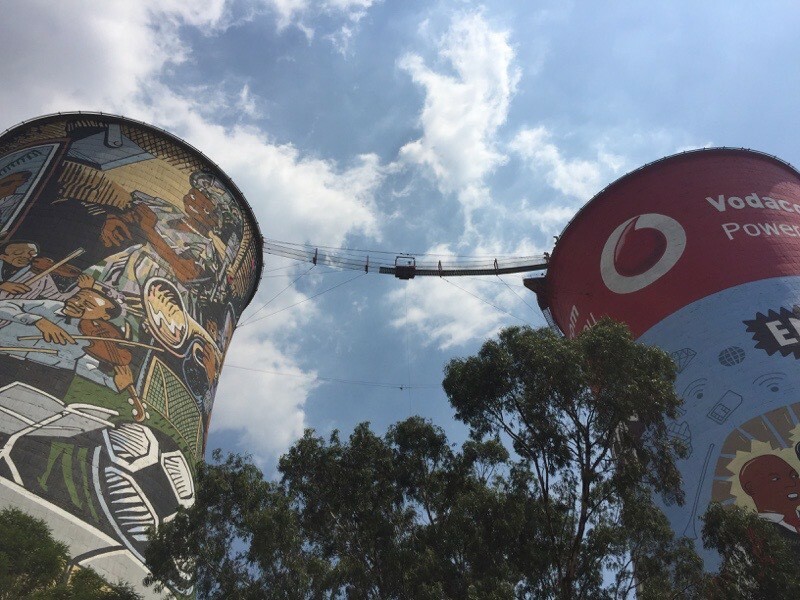 These towers have symbolized Soweto since 1936 when they began working to supply Johannesburg with electricity. 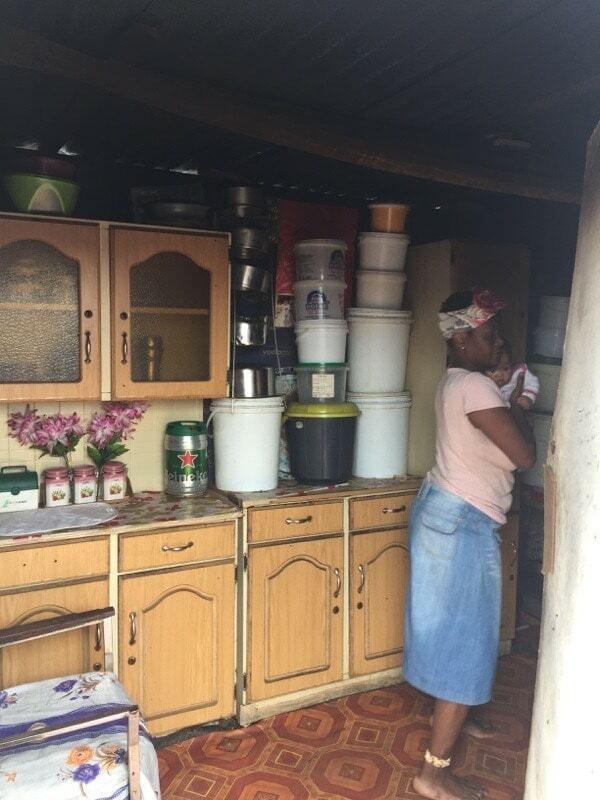 Despite being in Soweto, they did not provide electricity to Soweto until 1986. Imagine living with these cooling towers visible in just about any part of Soweto, and knowing that they are providing much-needed electricity to whites in another part of the city but not to you, the closest town. I simply can’t imagine living with that oppression. The cooling towers closed in 1990 and are now used for bungee jumping. The cooling towers, painted with really cool murals. You can bungee jump from there. No, gracias. We continued our tour of Soweto, seeing the house where Winnie Mandela currently lives, the house where Nelson Mandela lived before he went to prison and lived briefly when he got out of prison, and the streets where so much of Apartheid was enforced and the unrest played out. More on that later. That part is also still sinking in. I think South Africa will be our “where we learned the most” country, if you can even quantify such a thing. Dan took a short video as we walked through the camp, and then you are treated to South Africa’s version of a Happy Birthday song at a restaurant. Red Robin could learn a thing of two from these musical people.